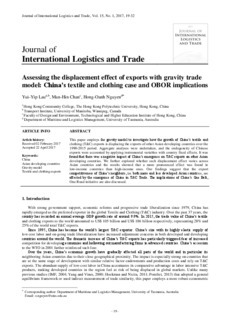 This paper employs the gravity model to investigate how the growth of China’s textile and clothing (T&C) exports is displacing the exports of other Asian developing countries over the 1990-2015 period. Aggregate analyses were undertaken, and the endogeneity of Chinese exports were accounted by applying instrumental variables with country fixed effects. It was found that there was a negative impact of China’s emergence on T&C exports on other Asian developing countries. We further explored whether such displacement effect varies across Asian countries and the results showed that a more pronounced effect was found in low-income countries than high-income ones. Our findings suggest that the export competitiveness of China’s neighbors, i.e. both more and less developed Asian countries, are affected by the emergence of China in T&C Trade. The implications of China’s One Belt, One Road initiative are also discussed.